On January 14, 2011, the British oil giant British Petroleum (BP) and the largest Russian oil company Rosneft signed an agreement on co-operation in development of three oil fields in the Russian Arctic shelf. This is a good commercial move, but the demonstrative neglect on the part of the Russian state corporation to environmental safety of oil production on the shelf. What awaits now the Russian Arctic and the Arctic in general? Catastrophe in the Arctic, even at ten times smaller than what happened in the Gulf of Mexico, with high probability can be catastrophic for the planet Earth. Exchange of shares with Rosneft gives BP access to oil fields in the Kara Sea, the licenses for which are owned by Rosneft. Rosneft, in turn, gains access to so needed technologies of oil exploration and production offshore. After the Deepwater Horizon accident on May 20, 2010, and the ensuing pollution of the Gulf of Mexico and the U.S. Atlantic coast, BP has lost a significant share of its authority. The catastrophe that took away lives, the inability of the company in a short time to stop the outflow of oil from subsea wells, huge fines for environmental pollution significantly affected the share prices of the company. The agreement with Rosneft on the same days when the U.S. Congress considered the report of the special commission on the impact of disasters in the Gulf of Mexico, has become a kind of "helping hand" outstretched to Bitish Petroleum by a leading Russian oil company. After information about this agreement, the BP shares went back to growth. According to experts, the three oil fields in the Kara Sea can bring participating companies about 600 billion barrels of oil. Rosneft's agreement with British Petroleum raises the question of safety of oil extraction in the Arctic. No emergency service, even many times higher than that were involved in the Gulf of Mexico, can cope with an oil spill in the harsh arctic conditions. Oil under the ice can be neither collected nor burnt. In certain conditions oil can be spread under the ice at the same rate as on the water surface. According to research by Russian scientists, biodegradation of oil in the Arctic waters occurs by 100 - 1000 or more times slower than in the sea waters with temperatures between 20 and 30 degrees Celsius. Therefore, the spread of oil on the Arctic Ocean with ice will last the entire period of the ice existence. According to current data about sea currents, oil from the spill in the Kara Sea will first move to the New Siberian Islands, then through the central regions of the Arctic to the Danish channel. After ice melting, oil will be distributed on the surface of the ocean. As a result, at least one third of the entire Arctic basin over several years will be contaminated with oil. However, the risk of an accident is not the most important factor in the alleged environmental damage. Oil companies worldwide consider oil pollution as a normal consequence of mining. "Moderate" (from their point of view) pollution of the environment has become commonplace. Therefore, the main source of the ocean pollution is just regular production and shipping, but not accidents. By some estimates, up to 20% of the world's oceans is covered by a thin oil film. The oil film prevents movement, nutrition and breathing of small organisms. According to research data from www.infox.ru, many zooplankton organisms are killed at oil concentration of 0.1 ml/l, and phytoplankton - at concentration of 0.001 ml/l. Even the thinnest oil filmon birds' feathers and animal fur promote their adhesion. In the cold arctic conditions, this leads to the inevitable hypothermia and death of animals. Consequences of a large-scale accident-free, but dirty oil extraction in the Arctic ecosystems could be catastrophic. Above all that, in the beginning of February 2011 the Russian State Environmental Committee (Rosprirodnadzor) confirmed that the license areas allocated by the Russian Government to PB and Rosneft in the Arctic for exploration and production of hydrocarbons by 2040 actually overlap with the territories of protected areas - the national park "The Russian Arctic" and the Yamal Nature Reserve (see map). Whereas oil and gas extraction in protected areas is strictly prohibited by the federal law. The total area of this match is more than 45 sq. km. 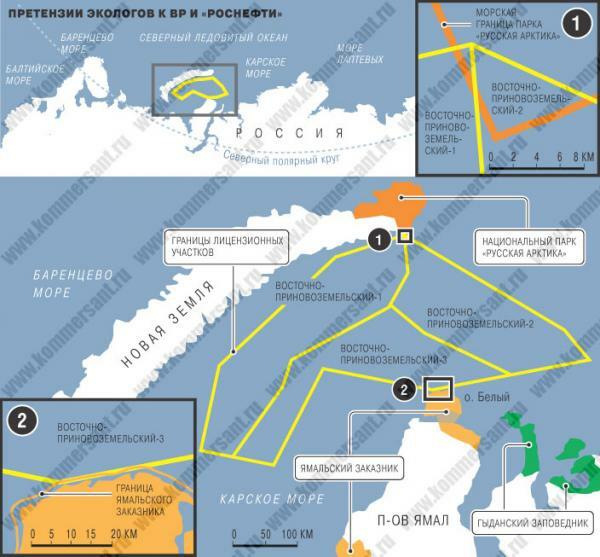 These areas of federal importance have been transferred to Rosneft and BP by Governmental Order No. 1699-p of October 11, 2010. It was after the transfer of parts of the Kara Sea shelf, that on January 14, 2011, the companies agreed to establish a joint venture for their exploration and development. Extraction, processing and transportation of oil and natural gas is the second most important anthropogenic source of methane, the most common after the carbon dioxide gas that contributes to the greenhouse effect around the world. Annually, about 88 billion cu m ³ or about 1.2 billion metric tons of methane in the carbon equivalent is released in the atmosphere. Continuation and increased use of fossil fuels like oil and gas will cause an increase in atmospheric methane emissions and result in significant adverse environmental effects. According to the Russian Socio-Ecological Union (RSEU), it is necessary to reduce the use of fossil fuels, to abandon their extraction in such sensitive areas as the Arctic, and to develop renewable energy sources. On February 19, 2011, the RSEU endorsed a letter to the Norwegian Prime Minister Jens Stoltenberg with a request to abandon plans for oil and gas extraction in environmentally sensitive areas offshore of northern Norway near the Lofoten, Vesterålen and Senja. The basic argument of the letter is that the expansion of production will lead to increased emissions of greenhouse gases (GHG) by the oil and gas industry of Norway, which is already a major source of GHGs in the country. Any, even minor, oil pollution of the Arctic Ocean is also detrimental to the planet's climate. Oil film reduces water evaporation from the ocean surface. As a result, the water covered with the oil film heats up noticeably stronger, being exposed to light. An oil film of only 1 molecule thick weaves a "network", which reduces water evaporation from the surface by 20%. A film 50 microns thick reduces evaporation by 60% (http://infox.ru). Melting of ice polluted with oil also occurs much faster. As a result, any oil spill in the Arctic will contribute to the rapid expansion of open water. In its turn, open water is heated by solar rays by several times faster than the surface of ice and snow. The Arctic has been already more than half-free of ice for several years during the summer season. After the start of oil extraction in the Kara Sea, the process of reducing the Arctic Ocean ice cover will become faster and will make a significant contribution to climate change. The decisions of the Russian Government and top BP and Rosneft management on technologies and safety for oil and gas extraction in the Arctic will determine not only the state of the environmental in the Arctic regions, but the fate of the planet. The RSEU position is that oil exploration and extraction in the Arctic seas may be allowed only with the technologies completely excluding oil pollution of the ocean, both in the case of an accident or during regular operation. While such technologies are not available, development of oil fields in the Arctic should be suspended.